Vector taken from a screenshot of the show. Zecora- "This at one time was never known, but I'm the first crystal Zebra to ever be shown." The african style of body jewlery being given a Renaissance/Medieval style twist was too hard to attempt, so I left them out rather than butcher the vector as a result with them. oh. Hm...that would be interesting to see what her gold would look like with the crystal affect. I love Zecora! XD She looks so cool! Who and how much do I have to pay to get my oc like this. Just look around, you'll find someone. SPAM ALERT!!!!!! SPAM ALERT!! GO TO INTERNET BUNKERS NOW!!!!! Never thought someone would make a crystal form for Zecora, cool. She looks beautiful! Great job! she is my favorite design ever!!! how is this a screenshot of the show? when did zecora look like this? The vector's base, the body, was taken from the show. 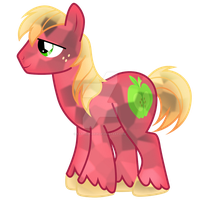 I give credit for all my vectors that are based even partly from the show. Since I only changed the hair and tail, I credited the show more than myself.